Once upon a time, it was a beautiful, sunny, summer afternoon and I was driving on the highway somewhere in Wisconsin. And then tragedy struck: a water bottle slid underneath the brake pedal. You might think the highway is the ideal circumstance for this to happen. But, anyone who knows anything about Wisconsin highways during the summer knows they are basically constant road construction (I can say that, I grew up there). We were barreling down on a traffic jam unable to brake. With some screamed expletives and a daring dive by my friend riding passenger, we emerged unscathed. Had we owned a Roll Rangler, the stress of this event could have been avoided entirely. Roll Rangler is a device created by MLC Research and Development. It slips behind your car’s seats to keep things from rolling into inopportune places- like under the seat or under your car pedals. This way, your car stays safe and clean. 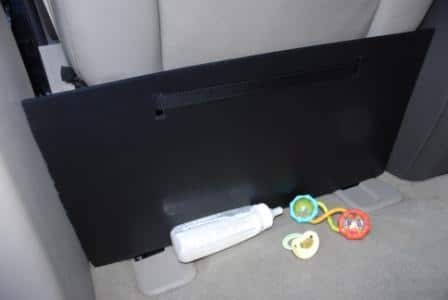 Our main product, “The Roll Rangler”, is a device to keep items in the backseat of a car from rolling under the front seat. This could mean that the package of salmon purchased at the grocery store and put in the backseat won’t end up under the front seat rotting in the sun. When you look in the back for your groceries you will easily spot it on the floor of the car. It is also helpful when you have grandkids that toss food, bottles and Sippy cups on the floor. You can easily spot these items on the floor instead of discovering them weeks later because of the stench. “The Roll Rangler” acts as a fence or barrier to keep items from rolling under the seat. I read an article about crowdsourcing and thought it was a great concept for finding logos and company names. As a startup we thought this would give us a lot of different creative inputs while keeping costs under control. After researching different companies on the web we thought crowdSPRING had the most resources available with a good cost structure and guarantees. Our biggest challenge is that we have a new product that no one has ever used before. Trying to market a brand new idea and even trying to convey what the product is can be difficult because no one has seen it yet. This presents problems in areas like advertising with Google. Finding relevant keywords to bring up a new invention in a search is a challenge. There is no precedent, so you have to get creative. Two areas posed bigger challenges than I expected. One was the patent process. Getting caught between patent lawyers and the government is a complex and sometimes unenjoyable experience. The other area is manufacturing and material costs. It is incredible how difficult it is to come up with a product that does what you want at a cost that people are willing to pay. I must be really boring because I can’t think of any crazy stories. A lot of headaches, heartache as well as joyful times, but nothing really crazy. Although hindsight is always great and there are always things we wish we could change, I think things happen for a reason. My dad always taught me that all education costs. The challenges and bad decisions made have all been learning experiences that have helped us grow and shape future decisions. Our growth will rely on innovation and adding new products and services to our line. Working in many areas from beverages to juvenile products to sporting goods will help keep us from getting bogged down in one industry as the economy falls and rises. We also design, make and sell our products in the U.S. Although things look a little shaky in our economy we believe the world’s largest economy will stand strong in the future. Be prepared for much hard work. Roll Rangler’s call for a new logo received 42 entries and was awarded to TMDCreations.